The problem is not religion but religious orthodoxy and the form it takes in human institutions. Throughout history, most moral thinkers - from Socrates to Christ to Francis of Assisi - eschewed the written word. Once moral teachings are written down they become, in the wrong hands, codified and used to enforce conformity, subservience and repression. Writing, as George Steiner has recognised, freezes speech. The moment the writers of the gospels recorded Jesus's teachings, they began to kill their message. There is no room for prophets within religious institutions - indeed within any human institution. Tribal societies persecute prophets; open societies tolerate them at their fringes. Today, our prophets are usually found not within the church but among artists, poets and writers who follow, as Socrates or Jesus did, their inner authority, an authentic religious impulse. When, the other day, I asked, rather vaguely: "what does an excessive concern for words and sentences mean for novels? ", I suppose the answer is that novels must try very hard not to be written. Schopenhauer, where are you now? Grim news I'm afraid. A friend reports from the Charleston Festival that Patrick Marber, so long a favourite as a writer and performer on The Day Today and Paul Calf's Video Diary (during which he cries out the blog's title), is embarking on a screenplay of Ian McEwan's Saturday. How depressing that people are prepared to put up vast amounts of money to fund this liberal wankfest. Time for another link to Ellis Sharp's seminal essay on this politically and artistically pernicious little novel. Worse, Ronald Harwood, who was Marber's co-panellist at Charleston, announced that he's to write the screenplay of Irène Némirovsky spectacularly-overrated and badly-written novel Suite Française. Harwood is a good choice though as he admits to having no pretensions as an artist, writing screenplays solely because it's a good life. I suspect, however, that if one took him at his word, and placed his work accordingly, he and all those nodding approvingly at such commonsense would cry "Snobbery! Elitism!". Earlier this month, lamenting the paucity of genuinely original novels, I wrote: I should admit that there is a novel published this month to which I can say: this is it ... But that'll have to wait until I find the words. Well, now I have found the words - about 1600 of them - and Ready Steady Book has kindly posted them all as a review of Tao Lin's first novel. Despite the ice-cold stair rods bouncing off my hands and face, I listened with interest to John Banville on Bookworm talking about his Benjamin Black thriller Christine Falls. 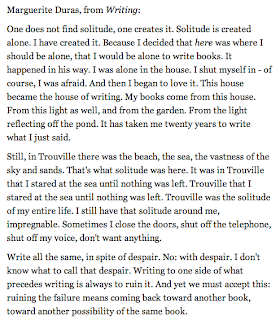 He said that, writing as John Banville, he would consider himself lucky if he had written 20 words by lunchtime. On the first morning writing as Benjamin Black, he wrote 2,000. For him it was “a whole new way of writing”; “when I write as Benjamin Black” he said, “I write as a craftsman”. Later, as I descended towards the village where a niece of Kafka's ended her days, I listened to Beryl Bainbridge talking on the Guardian's Hay festival podcast about a new film following a year in her life. Sarfraz Manzoor asked about the writer's block mentioned in the film. Was it, he asked, a case of running out of stories? "No, it's not the stories you're searching for, it's the words and how to construct it in sentences; that's the problem." There are stories cascading onto our heads, I thought as the rain abated, yet the words run on down the drain. Is this ever discussed in reviews? How might it be discussed? What does an excessive concern for words and sentences mean for novels? Questions, questions, but the literary pages demand only stories, ever more stories about stories. This morning, I read that Gordon Brown chose to read Sebastian Faulks' production-line novel Engleby because it was recommended to his wife by Mariella Frostrup, the smiling presenter of Sky's book programme. It was then I could see why I feel both uncomfortably close to "the world of books" and infinitely distant. While Mariella and Mrs War Criminal frolic in the hay, I'm impatient for the needle. Both the Inferno and, in particular, the Purgatorio glorify the human gait, the measure and rhythm of walking, the footstep and its form. The step, linked with breathing and saturated with thought, Dante understood as the beginning of prosody. Lately, rather than write in my minimal spare time, I've gone out walking or cycling. Not in order to get away from writing but in order to get back to it. Mandelstam's words above reminded me. Not writing is when I feel that I am making headway; writing. One steps through doubt; the tyres hurtle on toward the completion of thought. Perhaps too fast. The physical act of writing is itself a time of stasis, non-time. Almost non-thinking too. Anti-thought instead perhaps, thinking against the ease of movement. I don't like it. It's why I write so little and say the same thing, more or less, so often. I also walk and cycle the same few routes. So, I was (somehow) thinking: are there any (literary) subjects you think I should write about instead? Sculptor Lucie Geffré has produced a very impressive and, one has to say, uncanny bust of our favourite Austrian novelist. It even reproduces his bad skin! Link via the wonderful thomasbernhard.org. Gilles d'Aymery reviews Hans von Sponeck's A Different Kind of War: The UN Sanctions Regime in Iraq. Has it received reviews elsewhere? It was published last year by Berghahn Books but I don't remember seeing the interviews and reviews it seems to demand. Enough “furthermores“... This is where anger truly sets in. Hans von Sponeck catalogues the state of the Iraqi people: Child malnutrition, child mortality, calories per capita, adult literacy, per capita income, primary and secondary school enrollment, daily per capita production of water, sanitation... each and every benchmark being so dramatically horrible that one cannot read those pages without a sense of disgust, outrage, and shame. Neither Sade nor Lautréamont nor Genghis Khan could have devised such barbarian policies that turned out to be real weapons of mass destruction ... of a people. We did this to our fellow human beings very deliberately, methodically, and callously. How could we have done so without an upheaval in our human construct? We got Ian McEwan's Saturday didn't we? [It] gives rise to a peculiar technique of writing, and therewith to a peculiar type of literature, in which the truth about all crucial things is presented exclusively between the lines. That literature is addressed not to all readers, but to trustworthy and intelligent readers only. No, not John Carey grumbling about modernists again but Leo Strauss on what happens when writers are persecuted. Does that include by philistine cultural commentators? The philosopher, because he is always parasitic on society, occupies the position of someone persecuted. Esoteric writing thus reflects the tension between theory and practice since, Strauss argues, the wise philosopher will wish to avoid cruelty. He will take care, in other words, to propel his interlocutor toward a greater critical stance without imprudently (or cruelly) destroying his worldview. And so, rather than being the elitist or even fascist idea that has enraged so many of his critics, Strauss's notion of esotericism is simply, according to Batnitzky, an entirely sensible and even generous educational tool. However, my favourite academic publisher, also following heroically in this tradition, is Stanford UP, if only for its Meridian Crossing series. Going back to Lee's blog, there's a line under the title beginning "Scholarly tomes can be wilfully obscure". Now I noticed Rangy Manatee using this phrase too the other day ("Do the pair of them like Will Oldham because he is wilfully obscure?"). "Wilfully" seems to be added to "obscure" like "wine-dark" is added to "sea", "godlike" to "Odysseus" and "Mainly-Catholic" to "SDLP". Yet how can one prove that obscurity is ever wilful? Maurice Blanchot defines the quotidien as 'the familiar which is discovered (but already dissipated) beneath the surprising'. It is defined by lack of attention, and to think about it is to transform it. Essential to it, if not exactly constitutive of it, is the fragile quality of inattention it receives, a quality which needs, paradoxically, to be factored back into the attentive process if we are to make sense of it. May 31st, 7 pm. London. Calder Books. One of the few good reasons to live in London, which I don't. To mark the publication of the paperback, Tom McCarthy tells us he has "the huge honour of being interviewed about Remainder by the greatest publisher of the twentieth century, the person who brought us Beckett, Burroughs, Robbe-Grillet, Simon, Trocchi, Ionesco and, frankly, just about every writer worth reading for the last fifty years." That's John Calder if you're struggling. "Have you read Heidegger’s unpublished work on the duality of the new in the face of unprincipled reckonings regarding the torture that is being?" "Well, if you had, you’d understand all this. Idiot!" At just such an event many years ago, I met the Austrian writer Jakov Lind - "one of the best and most distinctive European, Austrian and Jewish writers of our time" according to Anthony Rudolf in his eulogy following Lind's death in February. It was to me in the bar afterwards he "implausibly" claimed not to have read Thomas Bernhard! Even if they get better, as BD's editor insists they should, I'm not sure eBook readers will ever be much use. I know it's not the same thing, but I've never finished a book in PDF form. Never even got far into one. Another appeared at the weekend courtesy of the Continental Philosophy bulletin board: Giorgio Agamben's Homo Sacer. When I heard that a record nine titles by Danish authors are to be published in English translation this year or early next, I began to list the Danish authors I had read already. But there was only one: Kierkegaard. No, I've not read Miss Smilla's Feeling for Snow. But one of those nine is a new one by Peter Høeg. Four of the remaining eight novelists - Leif Davidsen, Christian Jungersen, Morten Ramsland and Janne Teller - are to make a brief tour of Britain from the 22nd of May. You can see the details on the Book Depository's Editor's Corner. I hope, among the nine, there is something unusual, something unique. I would so like to point to a novel and say: this is it, this is the real thing. This blog has been quiet lately because I haven't been able to find the words to express how extremely I have felt recently about the way novels are written. How disjunctive to experience they seem; how novelistic; the work of craftsmen and showmen rather than mortals. And I don't mean that they're unrealistic. All genres, including supposedly literary fiction, seem to take for granted the space opened up by writing. Narrative as relief from the insufferable void of experience is indulged, celebrated even. To me, instead, it is a manifestation of despair. Coincidentally, said Danish writer, the only one I've read so far, expressed such an opinion about the disjunction between life and writing and what it meant for authorship. It is not improbable that the lives of many men go on in such a way that they have indeed premises for living but reach no conclusions. Such a man's life goes on till death comes and puts an end to life, but without bringing with it an end in the sense of a conclusion. For it is one thing that life is over, and a different thing that a life is finished by reaching a conclusion. In the degree that such a man has talents he can go ahead and become an author, as he understands it. But such an understanding is an illusion. For that matter [...] he may have extraordinary talents and remarkable learning, but an author he is not, in spite of the fact that he produces books. [...] No, in spite of the fact that the man writes, he is not essentially an author; he will be capable of writing the first and also the second part, but he cannot write the third part – the last part he cannot write. If he goes ahead naively (led astray by the reflection that every book must have a last part) and so writes the last part, he will make it thoroughly clear by writing the last part that he makes a written renunciation to all claim to be an author. For though it is indeed by writing that one justifies the claim to be an author, it is also, strangely enough, by writing that one virtually renounces this claim. Later, he concludes that "to find the conclusion it is necessary first of all to observe that it is lacking, and then in turn to feel quite vividly the lack of it." I should admit that there is a novel published this month to which I can say: this is it, although it happens not to be Danish. I'm pleased to say it observes the lack. But that'll have to wait until I find the words. Hurray for Tom McCarthy's top 10 European modernists list. Who could imagine Blanchot getting an unfatuous mention in a national daily newspaper? Yet here is one. Thanks be given to Tom McCarthy (and the editor who didn't insist on a replacement). Maybe a reader will be inspired to drop On Chesil Beach and to pick up The Writing of the Disaster instead. I have to agree with the statement that "Modernism is not a movement, nor even a way of thinking, but an event: an event with which any serious writer has, in some way or another, to engage, and to which they should respond." But. Always a but. But my list would coincide only with said Blanchot, Beckett, Kafka, Celan and Heidegger. I would replace the remaining five with Benjamin, Proust, Borges, Kierkegaard and ... Dante. The event is eternal, interminable. Notice: two philosophers, two novelists, two poets, two short story writers, two literary critics. Modernism trespasses. MediaBite, the Irish equivalent of Medialens, interviews Noam Chomsky. MediaBite: You are often charged with anti-Americanism, could you explain what you think it actually is? Chomsky: The notion "anti-Americanism" is a revealing one. It is drawn from the lexicon of totalitarianism. Thus people who think that the US is the greatest country in the world are "anti-American" if they criticize the acts of the Holy State, or join the vast majority of the population in believing that the corporate sector has far too much influence over government policy, or regard private corporate institutions created by state power and granted extraordinary rights as "a return to feudalism". And so on. The notion has an interesting history. It traces back to King Ahab, the epitome of evil in the Bible, who denounced the Prophet Elijah as an "ocher Yisrael" (a proper translation, now used in Israel, is "hater of Israel"). His reason was that Elijah condemned the acts of the evil King, who, like totalitarians since, identified the state (himself) with the population, the culture, the society. People are entitled to revere King Ahab and Soviet commissars, and to adopt the term "anti-American," on their model. But we should have no illusions about how they are choosing to identify themselves. Meanwhile, the BBC is running a series on the subject, with some breathtaking comments from BBC commissar Justin Webb in response to public questions. I don't feeling anything when I do paintings, at all. Nothing to feel. I rather like the dog in this painting. Francis Bacon responds to paintings and questions from Melvyn Bragg in a 1985 edition of The South Bank Show, via Ubuweb. (Doesn't he look like Derek Jacobi!). Ubuweb has made available a PDF of Maurice Blanchot's 1957 novel The Last Man as translated by Lydia Davis. Narration at the threshold of impossible writing, says the blurb. I've not read it, nor did I have a copy. In this apparent blog silence of late, I have been reading more than usual (currently Joan Taylor's seductive novel Conversations with Mr Prain) and working for money more than usual. But coincidentally, the place where I've been doing that work has lately caused a bit of a flurry in the book- and blog-world with the publication of Made in Brighton by husband-and-wife team Julie Burchill and Daniel Raven. So I'll post a blog about that. Here it is. The latter's chapter on the new media industry in this city, and particularly the company in which he still works, has caused its ex-CEO - featured prominently and unflatteringly in the chapter - to respond on his blog. The author has responded in the comments. PS: I'm not "Anonymous". I don't really have an opinion. I'm content just to sit in the corner and breathe and receive the occasional cheque.